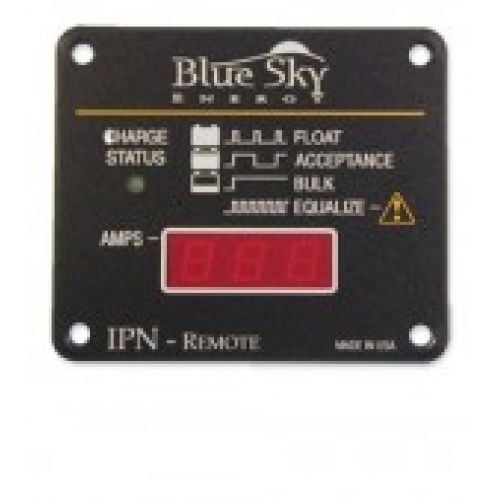 The IPN-Remote display provides basic monitoring for Blue Sky Energy’s IPN compatible charge controllers. The unit displays battery voltage, output current and charge control system status for up to 8 charge controllers on a single IPN network. A bright crisp low power LED display is used to provide excellent readability in any lighting. The Charge Status indicator displays present charge control system status, and shows relative battery state of charge. The versatile IPN-Remote shows battery voltage as measured by the charge control system. When the battery is being charged the display toggles between battery voltage and charge controller output current. The current display can be configured to show the total output current from all controllers on the IPN network, or the output current from a particular controller.